ERoEI is a "word" you will frequently come across when reading about energy, the letters mean "Energy Return on Energy Invested". Its a term which the future will bring to the table more often than we would like to know. If you look at the current civilization you will notice that we have gotten used to having a lot of energy available to us at all times. The reason for this is because its cheap and available. 250 years ago, energy wasn't very cheap, unless you had many slaves working for you. Even though one slave could only do so much with his time and you had to clothe and feed him to keep him running. But the moment we invented the steam engine, we could use coal to power it and the machine could to a lot more work with one man feeding the engine with coal. We could say that the energy density of coal is much higher than the food that a human requires to do physical work. This energy density is very important and the primary reason for why coal, oil and gas is used so much. You could argue that nuclear power from uranium even has a higher energy density, but unfortunately it also requires a very costly investment to set up compared to pumping oil out of the ground. The fact that after 100 years of motoring we still use petrol to drive our cars is simply because there is nothing that can compare to the simplicity of a liquid fuel like petrol. Replacing such a system with something else would be a massive challenge for the future, a problem I will come back to in a later post. But lets get back to our EReOI term, why is this important? 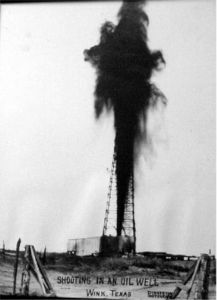 Well, if you look at the first oil wells you could just poke a hole in the ground and the oil came gushing out. In other words, the initial oil required very little energy input compared to what you got back. It is often said that they had over a 300:1 ratio, so for every barrel of oil you used to create and operate the well, you got 300 in return. Ok, that's a huge return for the energy invested. Unfortunately, as oil wells are depleted, you need to put more and more energy into pumping and processing the oil so the EReOI goes down. Fast forward to present times, and its becoming increasingly hard to find oil at all, each well requiring an immensely amount of energy input to find the oil, and then equally a lot to get it out of the ground. The present oil is probably around 12:1 for most of the imported oil to USA, and falling still. The problem is that as oil becomes harder to extract, the quality of it also goes down, requiring more and more energy into processing it as well. The tar sands in Canada is a prime example of where ERoEI is rather terrible at 3:1. 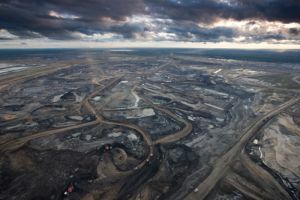 Consider the fact that we humans would first go for the easiest stuff to extract, its a sad story that we find it worth our time to do oil extraction projects like the tar sands. It should tell the reader something about where we are currently at. When the ERoEI slowly creeps toward 1:1 we are basically entering an era of energy shortage to feed our present civilization. Remember how energy dependent our infrastructure is. As energy becomes harder to extract, the price will naturally rise as it has in the past years - wreaking havoc in our financial world as everything just cost more to run. Again the link to the economy shouldn't be neglected. Every part of the economy is affected, including the cost to maintain each meter of road or any other utility we have gotten used to. The link is a two way one as higher oil price also makes it possible for companies to start oil extraction projects that was previously not affordable. Many people say that we have to get used to $100+ barrel oil prices, as the oil that is still left in the ground is very costly to extract as it requires a big investment in equipment and infrastructure to get going. ERoEI is seriously biting now, and we should all think about how to conserve energy in any way we can. From simply driving less to planning ahead what energy you need for certain tasks. It is clear that eventually we will have to move away from fossil fuels unless they are the super concentrated ones used for nuclear power generation - although we are far from having enough of this to support the immense transport requirements we have gotten used to. We used to say the planet has become smaller - well, the future like it looks now - will make it big again. Chances are that the future will not have commercial air flight, except for a very small elite, as we still haven't invented electrically driven planes. The more you explore the world of energy, the more you will see that oil has been the most fantastic substance we have found on our planet - but will only benefited a very small selection of human generations over a timespan of 300 years as the finite resource dwindles. It will take millions of years for the planet to produce another batch. According to Hubberts peak oil statistic, we have by now used half of the planets oil reserves. The remaining part is the hard and costly part to find and extract. Lets at least use that share to transition into a more sustainable future with regards to energy conservation. So instead of driving to the gym to work out an hour, perhaps you should just go outside and run around a couple of blocks? We all need to start thinking about this now, or at least start to prepare our lives for less but more expensive energy. As you become less dependent e.g. driving your own car, you might realize also that you will live a simpler and more peaceful life as well. Buying less stuff will also reduce the stress on energy use, but naturally also affect the economy - perhaps in a way that makes us care less for "stuff" and more about sustainability? Buying local products is also a good way to conserve energy as food and things don't have to be transported halfway across the globe first. The limits are showing now already, but are you ready to embrace them, or do you choose to fight them? Or do you expect some technological breakthrough any day now? Like, Chris Martenson say, remember that technology isn't an energy source - its an energy sink. We have only used some technologies in order to locate energy, and then used a million other technologies to consume that energy.